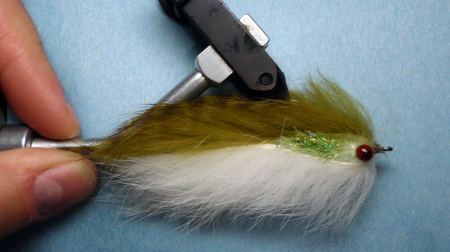 The Double Bunny fly by Scott Sanchez is a ground breaking streamer pattern. It is tied as a baitfish imitation, and capitalizes on the incredible action of bunny. The fly looks cool before you get it wet, and even cooler in the water. It is easy to understand how successful it is when you see the action of the fly. I found an article Scott wrote on it's origin, and it is included below. Keep reading for the properties of bunny that make it good for flies but even better for Buggs! "The idea for the Double Bunny came to me almost 20 years ago while on a fishing trip to Belize. John Hanlon and I were trying to catch some barracuda that were not being cooperative. The two flies that ended up working the best were a Kiwi Muddler and a FisHair Cuda Fly. What could happen, I wondered, if I put together the pulsating action of rabbit fur and the undulation motion of a 'cuda fly? I didn't have the necessary materials to tie the fly on that trip, so it had to wait until I was home. Some months later, while fishing my home waters of Jackson, I watched a large trout chase a smaller fish on the end of my line. The idea of the "super barracuda" fly came back to me. That night the first Double Bunny popped out of my vise. The first time I fished the new fly, the lake trout and cutthroats in the Snake river below Jackson Lake were chasing it harder than a politician looking for Florida votes. I've used it successfully ever since. It's a great fly for finding and catching large fish. 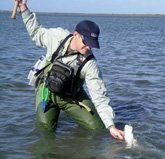 So far it has subdued more than 30 species ranging from cutthroats to tarpon - even a catch-and-release fly-rod record channel catfish." Scott then explains that the 1992, 1993, and 1994 Jackson Hole One-Fly competitions were won on Double Bunny variations. There is an interesting twist to this story. From the Jackson Hole One Fly website, "In 1994, the Double Bunny was victorious again. Carter Andrews, who had tied the "Son of Bunny" for 1993 winner Walter Ungermann, was the angler who fished it to perfection. Carter set a record for the most points ever scored in One Fly history. Carter fished the fly deep, with amazing results on the South Fork river on Saturday. He racked up more than 900 points, and followed on Sunday with 500 points to cinch the title of "Top Rod." 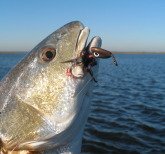 Here comes the twist... After an unprecedented three year run, "Changes in the One Fly's 1995 rules limit the hook size to an 8 and length to 3x. The Double Bunny will not disappear, it will just be more challenging." And from the 1995 page of the website, "The 10th Anniversary of the Jackson Hole One Fly celebration was highlighted by speculation over which fly would emerge the winner after the three-year reign of the Double Bunny. Though the Bunny was not technically banned the largest allowable hook size would be a number 8 with a 3X shank which essentially removed big streamer patterns form the competitive picture." Banned indeed from the most famous Fly Fishing Competition in the US, but perfect for Buggs Fishing Lures! Here's the rest of the story for bunny flies and lures. The action of bunny is best when it is wet, soaked all the way through. This makes it difficult to fly fish a Double Bunny. 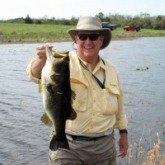 I experienced it first hand as I tied on a 4" black version bass fishing a few years ago. I was in my kayak, and trying to double haul the soaking wet fly was a chore! This issue disappears when you fish a Buggs Fishing Lure, all of which incorporate bunny. The extra weight is no burden when fishing bunny on a lure. You take advantage of all the unique properties with none of the drawbacks. And Buggs haven't been banned...yet! I hope you enjoyed the story of the Double Bunny. I encourage you to pick up a few Buggs and experience it first hand. You can also tie a Bugg or Fly using bunny. There are dozens of colors, and it can be utilized to create imitations of almost anything but a dry fly.